2014 Toyota Tundra How our users rated the 2014 Toyota Tundra. Based on 1,264 user rankings. Driven or own this vehicle? Rank this vehicle to share your opinion. 2014 Ram 1500 How our users rated the 2014 Ram 1500. Based on 1,177 user rankings. Driven or own this vehicle? Rank this vehicle to share your opinion. 2014 Ford F-150 How our users rated the 2014 Ford F-150. Based on 912 user rankings. Driven or own this vehicle? Rank this vehicle to share your opinion. 2014 GMC Sierra 1500 How our users rated the 2014 GMC Sierra 1500. Based on 847 user rankings. Driven or own this vehicle? Rank this vehicle to share your opinion. 2014 Nissan Titan How our users rated the 2014 Nissan Titan. Based on 1,539 user rankings. Driven or own this vehicle? Rank this vehicle to share your opinion. 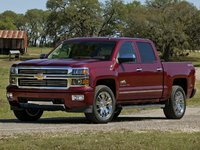 2014 Chevrolet Silverado 1500 How our users rated the 2014 Chevrolet Silverado 1500.